Eugene was twelve years old when he enrolled in the Sheldon Jackson High School, and stayed at that boarding school until his graduation. There he worked as the early morning fireman, took courses in vocational g in Machinery and Plumbing, and worked in the school’s hydroelectric plant with diesel oil burners. Eugene took part in the usual occasions such as the Easter Sunrise Service, and was in the Church Choir, often singing at the Sitka Pioneer Home. He was an avid student of the Holy Bible, often pondering the mysterious questions of the Bible. He always participated in Field Day events, the Sheldon Jackson Fellowship activities, the school band, and the midweek Prayer Services. He played Varsity Basketball as well as Track, and held the record High Jump at 5’10” for many years. He also played Soccerball, Football and was in Amateur Boxing. He earned good grades with hopes of going on to college. Eugene graduated in May 1937. In 1938, Eugene began – working on the Sheldon Jackson Presbyterian missionary boat, the Princeton Hall where he took a beginner’s course in Navigation. They traveled constantly, held meetings in small communities, sometimes helping in repairs and maintenance of community churches, picking up students to attend Sheldon Jackson, delivered groceries to ministers in outlying communities, and ran mercy missions where they would pick up people needing hospital attention. Eugene and Melba moved to Douglas, Alaska to teach the tenets of the Bahá’í Faith to the Native people under the guidance of the National Spiritual Assembly of Alaska. He traveled to Hoonah during the late 1950’s to early 1960. He also went to Angoon, Fort Yukon, Fairbanks, Anchorage, Nenana, Southeast, Cordova, and Valdez. He was elected to the Spiritual Assembly of Douglas and that year was elected a delegate to the Bahá’í National Convention, then in 1970 he was elected to the National Spiritual Assembly. He served on that body in 1970-71. Eugene and Melba moved back to Seattle for health reasons in April 1972. Eugene returned to Juneau, Alaska in November 1979 after Melba passed away and was once again elected to the National Spiritual Assembly from 1980 to 1991, when poor health forced his resignation. I knew Inga Wilson since I was 10 or 11 years old. She and Emmerson were married in 1916 – 3 years before I was born. My father was best man at their wedding. I worked for Emmerson for a time installing sprinkler systems in Lakewood. When I was a child, there were Alice and Inga (Inga Wilson’s two daughters) and my older sister and me – four children in two families. I was very found of Inga. I felt like a son to her, and she considered me as her son, and a part of her family. Inga followed my career. I know she followed my career up to the time she died – I know this because Elizabeth Johnson would clip out all the news articles and send them to her. I know Elizabeth very well. She and Inga were always arguing. Always! Yet they were always the best of friends. I never understood that. They were always arguing over who was smartest: Norwegians or Swedes. They would keep us rolling in the isle with laughter. Inga was the most compassionate, thoughtful, and loving person I have ever known. She didn’t have a prejudiced bone in her body. She felt no prejudice with regard to race, religion or color. If ever there was a person who practiced her faith, it was she. A lot of people just go to church on Sunday. She was not like that: she lived it and loved it and practiced her faith every day. Inga Wilson, 89, a former Tacoma resident, died Sunday in Las Vegas where she had lived the past several years. She was born in Bergen, Norway, and came to Tacoma about 50 years ago. She lived in California before moving to Las Vegas. She was of the Bahá’í Faith. Survivors include two daughters, Mrs. Nick (Alicia) Georgiade of Las Vegas and Mrs. Richard (Inga) Jay of Tryon, N.C.; a sister in Norway; and three grandchildren and three great-grandchildren. Buckley-King Downtown is in charge. Inga Wilson’s funeral service was held in Tacoma on September 10, 1984. Judge Jack Tanner spoke at her funeral. 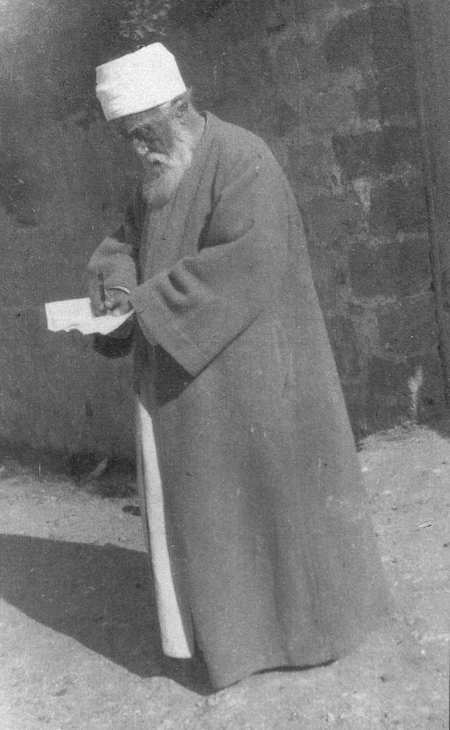 ‘Abdu’l-Bahá is shown writing, perhaps a letter to a Bahá’í. Here is a story about how ‘Abdu’l-Bahá treated his enemies. 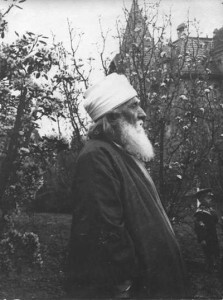 When the Master came to ‘Akká there lived there a certain man from Afghanistan, an austere and rigid Mussulman. To him the Master was a heretic. He felt and nourished a great enmity towards the Master, and roused up others against him. When opportunity offered in gatherings of the people, as in the Mosque, he denounced him with bitter words. His name was Haji Siddiq Musalman (Muslim). ‘This man,’ he said to all, ‘is an imposter. Why do you speak to him? Why do you have dealings with him?’ And when he passed the Master on the street he was careful to hold his robe before his face that his sight might not be defiled. The Afghan was poor and lived in a mosque; he was frequently in need of food and clothing. The Master sent him both. These he accepted, but without thanks. He fell sick. The Master took him a physician, food, medicine, money. These, also, he accepted; but as he held out one hand that the physician might take his pulse, with the other he held his cloak before his face that he might not look upon the Master. For twenty-four years the Master continued his kindnesses and the Afghan persisted in his enmity. Then at last one day the Afghan came to the Master’s door, and fell down, penitent and weeping, at his feet. The Master bade him rise, and they became friends. This is a tribute to the seven Bahá’í martyrs of Hamadan, Iran who suffered imprisonment and endured cruel torture before finally sacrificing their lives for their religious beliefs on June 14, 1981. 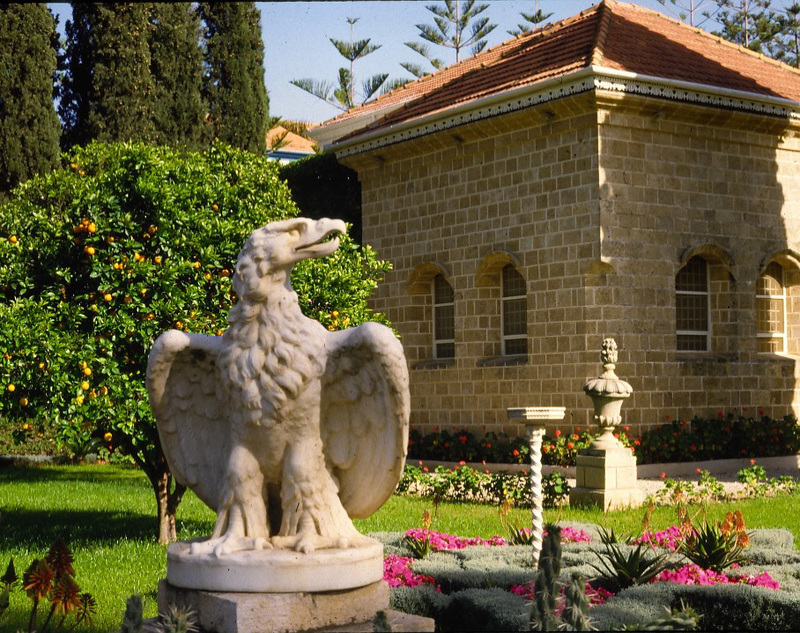 The excerpts from letters written in their final moments of life provide us with only a glimpse of the deep love for the families they left behind and the profound courage and nobility arising out of the depth of their love of God and their faith in His Messenger for this age, Bahá’u’lláh. The hauntingly beautiful music was composed in their honor by Farzad Khozein, a nephew of one of the martyrs. To simply be a Bahá’í in Iran is an act of courage in and of itself. We who are fortunate enough to live in relative freedom continue to send them our love and our prayers. Here is a more graphic account of their martyrdoms. 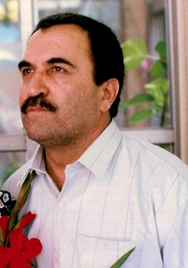 The body of Husayn Motlaq Aráni showed no signs of torture but he had been shot nine times. Muhammad Baqer Habibi had a broken shoulder; Dr. Násir Vafá’í had had his thighs cut open as far as the waist and had been shot seven times; Husayn Khándil had had the fingers of one hand pressed and his back had been burned; Sohráb Habíbí had had his back burned and had been shot five times and Tarázu’lláh Khuzayn suffered a smashed chest and left hand and had been shot seven times. The ribs of Tarázu’lláh Khuzayn were crushed, and his hands were slashed. His legs and thighs had been pierced with a bayonet, and the injuries had turned his skin black and the tissues were swollen. [He was sixty-four when he died.] Suhráb Habíbí’s back had been branded with a hot ring – his own – and he had severe burns. The fingers of Husayn Khándil were slashed and his abdomen had been cut open. Dr. Na’ímí’s back had been broken and Dr. Vafá’í’s thighs had been cut open; Suhayl Habíbí’s shoulders had been broken and smashed. Hossein Mutlaq had not been tortured but his body showed the greatest number of bullet wounds.